Flagship Housing Group needed a cost effective approach to achieving sustainability targets such as EcoHomes and the Code for Sustainable Homes, and invited us in 2004 to work with Oxbury & Company to develop a flexible housing prototype. 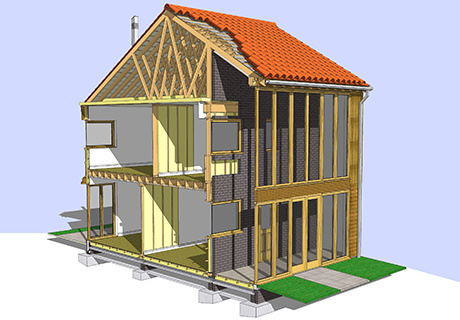 The result is GreenGauge Homes; an approach to building sustainable housing that can improve on government guidance on energy efficiency and still be built within the Housing Corporation’s Standard Grant Funding Structure. The warning signs for climate change were discernible long before the public became aware of 'global warming' and appropriate technologies and products were already well established by the time the subject became headline news. Partnership with Flagship Housing Group and Oxbury Ltd. So rather than trying to 'reinvent the wheel', the partnership identified tried and tested technologies for building materials and energy generation, and developed a system to suit a variety of locations and layouts. The resulting product is GreenGauge Homes, which can be offered in various formats to Flagship’s affiliated Housing Associations. The product is in use in a number of Local Authority areas and has featured in Flagship’s application for the Housing Corporation Gold Standard Awards for Affordable Housing. The first scheme at Lingwood was completed in 2008.